Please join the Children and the Earth's annual fundraiser. There are a few exciting changes....they have combined their event with Coonyz Customs Gift of Life Rally and have Leatherheads Sports Bar. To bring you the most amazing event yet....featuring an all day event in the Draper Spectrum Parking lot in front of Leather Heads. There will be a 5K, motorcycle rally, 5 bands (including headliners like The Hard Rockin Johnsons), vendors, great food, and stuff for kids too! The 5K in $20 pp and the mototrcycle rally is 25.00 for a single rider and 30.00 for double. The ride includes breakfast, lunch, t shirt and entrance to concert. More details later on the route to the ride. Please come out and enjoy yourself while giving back and assisting over 30 needy children. 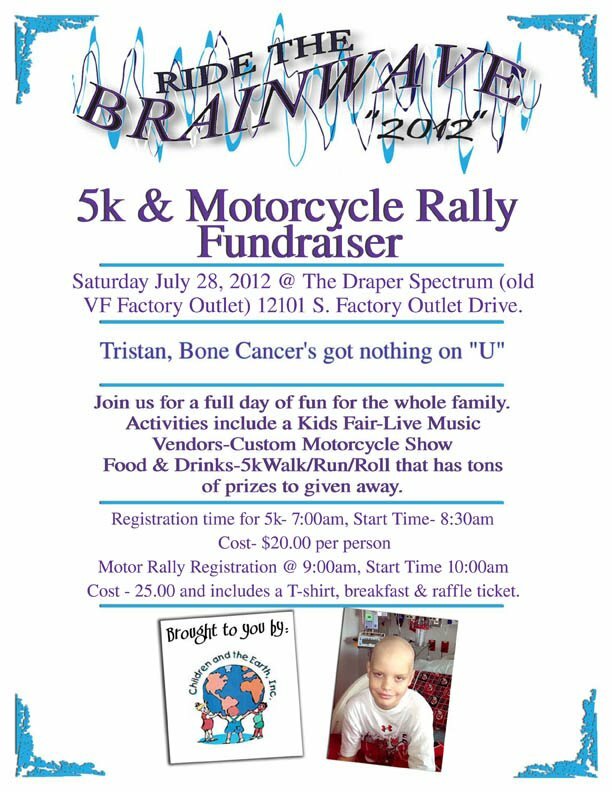 We are also looking for prize items, donations for the raffle, and corporate sponsors its all tax-deductible...LETS PAY IT FORWARD!!! For more information, if you know somebody that needs help, or if you want to help, visit their facebook page.